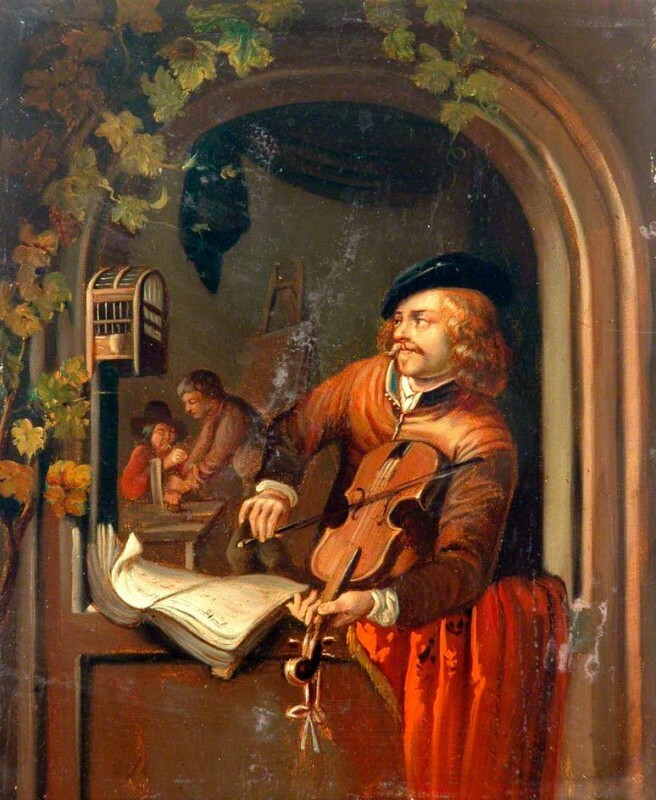 ‘The Violin Player’ in the collection of Calderdale Metropolitan Borough Council has been identified as a nineteenth-century copy after Dutch master Gerrit Dou. Before this, the artist had been listed as an unknown from the Flemish School since the painting was donated to the Council in 1968. Consensus was quickly reached that the painting was a nineteenth-century copy of Gerrit Dou’s 1653 painting of the same name, currently in Liechtenstein. William Shupbach from the Wellcome Library helped account for the differences in style and execution between the Calderdale copy and the fine Dou original. Schupbach explained that nineteenth-century copies of Dutch Golden Age painters were often mass-produced for a middle-class customer base. By contrast, Dou’s paintings were slowly executed with 'extreme finesse' and 'frequently acquired for princely collections'. Following the date and attribution of the work, conversation moved on to specific features in the painting. The grape vine that borders the window in the Calderdale copy is absent from Dou’s original, but is a feature that Tim Williams identified in many other copies of the image. Tim suggested that the addition of the vine could be traced to a lost version of the painting, an etching of which was produced in 1776. Several paintings were mooted as a prototype of the copy. After Susanna Avery Quash consulted Betsy Wieseman, Curator of Dutch and Flemish Paintings at The National Gallery, the original painting was suggested to be by Frans van Mieris the elder, executed in c.1655 and now in a private collection. Oliver Perry expressed some doubt over this suggestion. He cited a PhD thesis about the initial painting by Dou. The piece mentions another version of the image by Dou himself, now in Basel, which includes the elusive grape vine. Ultimately, the search for the source of the grape vine was promising but inconclusive. Tim Llewellyn recommended the reattribution of the painting to ‘after Gerrit Dou’ and agreed that the painting was a nineteenth-century copy. This was accepted by the collection. If any Art Detectives wish to contribute information on the painting, or to continue the search for the source of the grape vine, please propose a discussion by following the Art Detective link on the artwork's Your Paintings page. Is this work after Gerrit Dou (Dutch 1613–1675)?